You are interested in CAR ASYST and want to test the app for free? 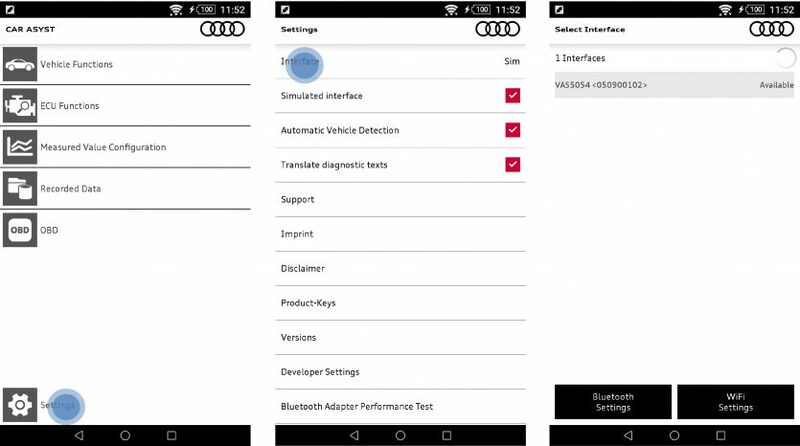 From now on we offer a free 30-day demo version with which you can use simulated data (Audi Q7) to get to know the CAR ASYST APP features. Additionally all owners of the VAS 5054A adapter have the possibility to test CAR ASYST directly with a real vehicle. 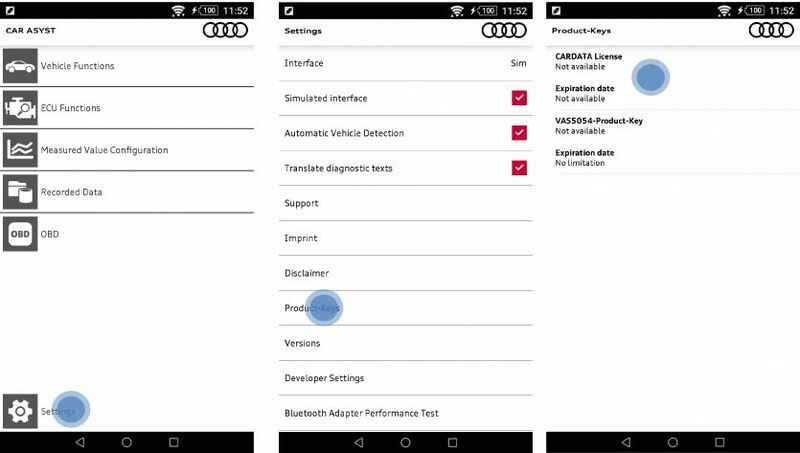 After starting the app you can enter the key by navigating to Settings – Product-Keys and click on “CARDATA License” to enter your personal demo product key. CAR ASYST is now ready for you to begin your trial. What features are supported by the 30-day demo version? Vehicle error memory can be read but not deleted. The creation of a vehicle report is possible as well. The transport mode can not be activated or deactivated. The creation of a vehicle report is possible, but the error memory entries are not shown. The transport mode cannot be set. To see how error memories are presented, please use the simulation mode. All found ECUs are shown. In the demo mode only the engine ECU can be used. Reading the error memory and using the diagnostic test mode is prevented. Only 3 measured values are available. They can be shown either textually or graphically. Recording vehicle internal bus systems („Mirroring“ -> CAN, FlexRay, LIN) cannot be configured in the demo mode. Three measured values from the engine ECU are available. Setting triggers or other sensors has no restrictions. This feature has no restrictions in the demo mode. The developer setting are not viewable in the demo-mode. All other menu entries are available. Testing on a real vehicle – Do you have a VAS5054 adapter available? To use the demo version with your VAS5054, you first have to connect your smartphone or tablet with the VAS5054. To do this, go to the settings menu „Interface“ to select the adapter. Select your desired adapter by clicking it. Then hit “back” and the app will connect to the adapter. This will cause the adapter to be updated, which has no implications for other applications that use this adapter. CAR ASYST APP is now ready to be tested with a real vehicle!